Hey everyone! 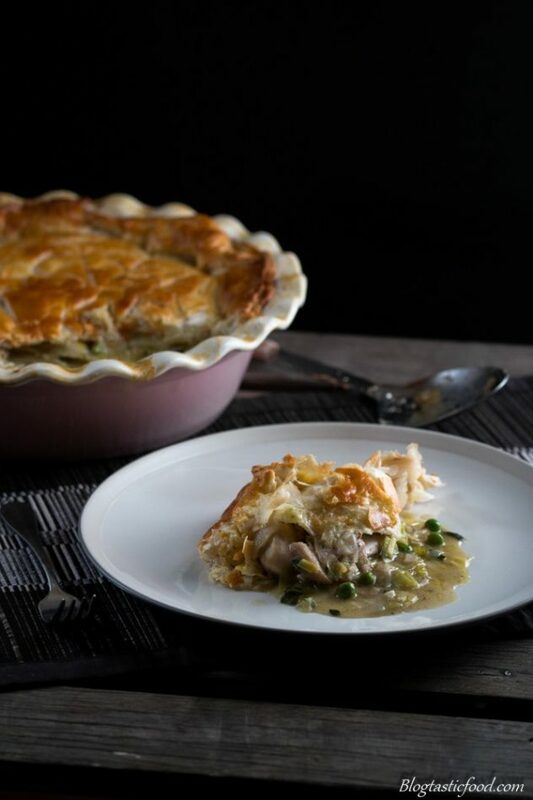 This Chicken & Leek pie is a fantastic comfort food dish for the family. Now I know I know, it has been a while and I do apologise about that. I have been very busy finishing 5 assessments at school, and eventually I came to the conclusion that it is probably not the best idea to try to work on the blog at the same time. As that could just lead to a tonne of stress, and I would just end up half assing my school work and my blog work. I would rather take the approach of doing a good job at both. But I am back in action, and I am working on a super cool idea that I think you are all going to love. But for now, lets focus on the pie. I love leeks, yet I rarely cook with them. So I wanted it to be the main ingredient for the next recipe I make. Plus it’s winter for me at the moment, and leeks play such a great role in many winter recipes. Such as casseroles, soups, stews or in this case, pies. The kind of recipe that will warm you up and fill you up. And that is why I didn’t want to muck about with this dish. Just a really nice, flavoursome filling with crispy puff pastry layered over the top. I decided to use chicken thighs rather than chicken breasts, because the thighs can be cooked for a long period of time without going dry or tough. Actually on that note, I’ll quickly just mention something that can be of value. 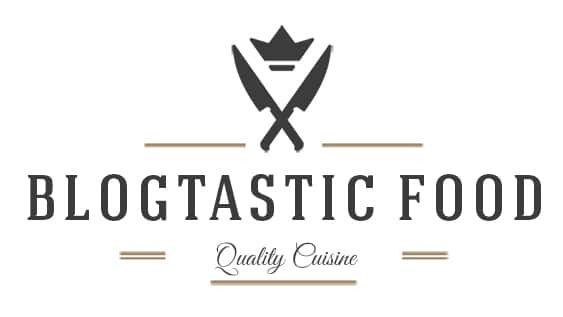 If you are going to make a chicken dish, it is worth thinking about what type of dish you are going to prepare. Is the chicken going to be cooked for a long period of time? Will it be simmered or braised through a stew? In this case you may be better off using the thighs or the legs. Or will it be cooked on its own, served with a simple salad on the side? if so, the breasts or the wings may be a great option. Don’t make this a rule, but rather a useful guideline. This chicken & leek pie is a warming, filling and comforting pie recipe for a cold day or any gathering. A great way to feed the family. Melt your butter in a pot on medium heat. Once the butter is melted and foaming, add your flour and stir through until a paste forms. From there, start adding your chicken stock a bit at a time stirring through on each occasion. At first, the mixture may appear lumpy when you add the chicken stock. But don't panic, just keep stirring, and don't add anymore stock until the mixture is smooth. Once all of the chicken stock has been incorporated, bring the sauce to a boil, then turn the heat down low and simmer for 10-15 minutes stirring occasionally. Pre-heat a pot on high heat, then add half of your olive oil. Add your chicken thighs and brown them to give them some colour. Remove from the pot and transfer to a plate. Turn the heat down to medium heat then add your butter and the other half of your olive oil. Once the butter is melted and foaming, add your sliced leeks and fry for a few minutes until they start to soften. Add your garlic, ginger, dried oregano and thyme leaves and fry off for a few more minutes. Add the sauce, frozen peas, ground coriander and mint then stir through. Turn the heat off and transfer the mixture in a pie dish. Lightly flour a flat, clean surface. 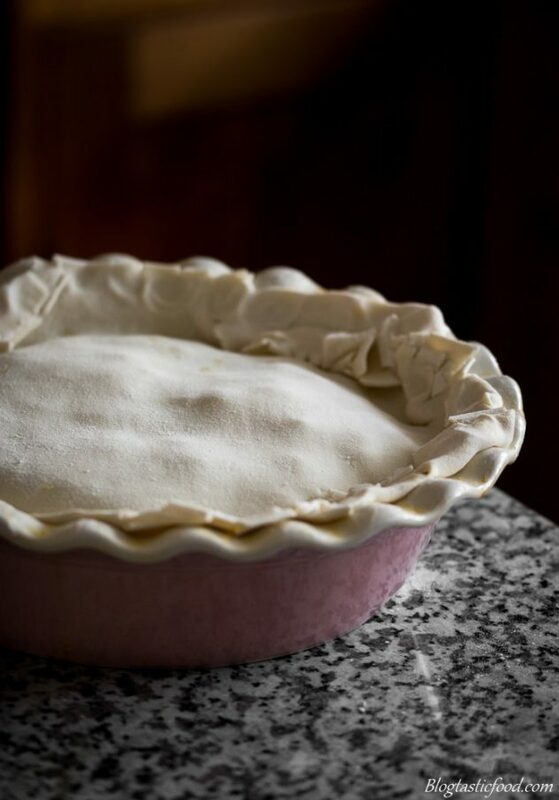 On that surface, lay one sheet of puff pastry neatly on top of the other one (make sure the puff pastry is completely thawed out if you froze them beforehand). Lightly flour the top, then use a rolling pin to roll the two sheets together to about half the thickness. Crack your egg into a bowl or container, then quickly beat it with a fork. Brush some of the beaten egg around the rim of the pie dish. Then carefully lay your puff pastry over the top of the filling. If there is too much puff pastry hanging over the sides, trim some of fit off, then just tuck in the rest. 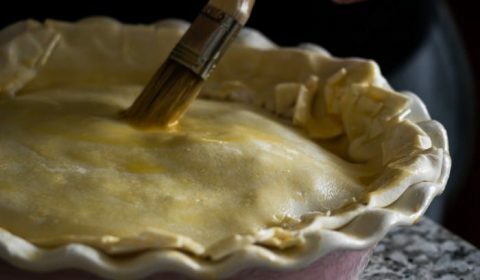 From there, firmly push the sides of the puff pastry on the rim of the dish to make a tight casing. Finally, egg wash the top of the puff pastry. 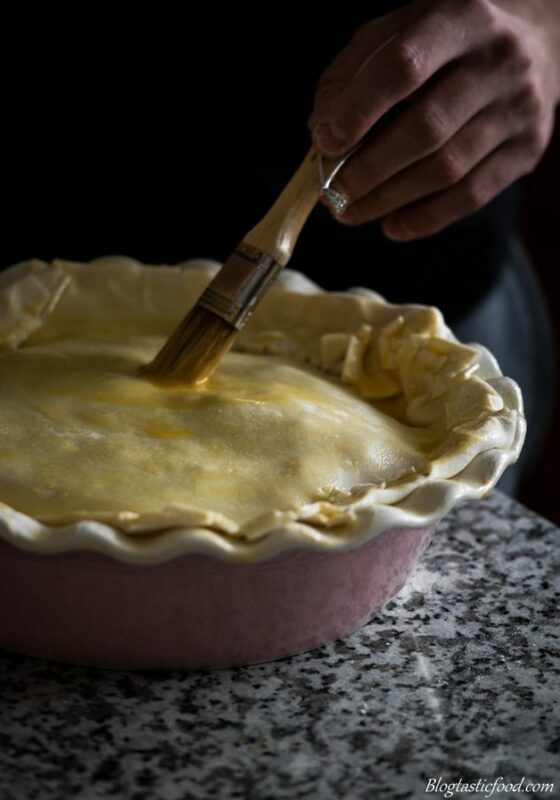 If you want, you can use your knife to make some light slits in the pastry for decoration. Place in the oven and bake for 35 minutes until the puff pastry is golden, crispy and cooked through. 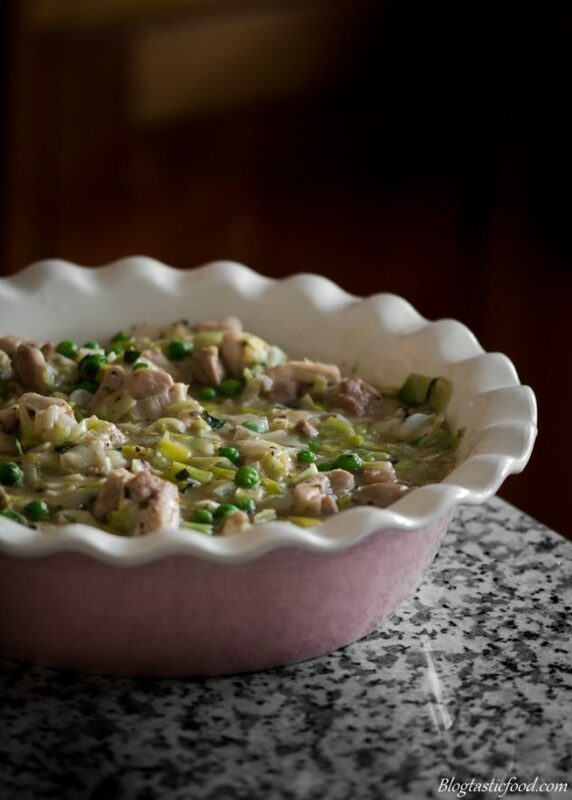 Love this idea of Leek pie , lovely !